Our 4th floor, elevator-serviced, spacious, cathedral-ceiling, fully-appointed vacation condominium, with three ceiling skylights, awning-covered lanai, indoor and outdoor dining tables, offers spectacular panoramic ocean views and splendid sunsets, and will be your home away from home. Dine on the lanai and watch the changing sea and sky, stretch out by the pool or Jacuzzi with a good book and a cool drink, contemplate the future with a soak in the sauna, BBQ your dinner on the gas-fired BBQ's at either the tennis courts or the pool, play a game of golf at nearby Wailea and Makena courses, or better yet stroll across the road to one of the finest white sand beaches on Maui - the beautiful Kamaole I and II beaches, where the gentle surf will lure you in to swim and snorkel the reefs in the clear warm blue waters, then bask in the bright Kihei sunshine. As an added plus, from December till May, humpback whales will lure you shoreward to watch mothers cavorting with their calves. Kihei's average daytime temperature is in the low 80's and evenings are always pleasant. Its central location allows you to reach all the wonderful activities available on Maui easily. Windsurfing, paddling, kayaking, and surfing are all easily accessible sports for the adventurous, and world class resort golf courses and fine dining are minutes away. A visit to our beautiful island paradise will unveil the true meaning of 'Maui no ka oi' or Maui is the best! Lothar was born in Cleveland, Ohio, and Carole was born in Brooklyn, NY, but we both spent our early years in Los Angeles, and went to UCLA. We moved to San Francisco in 1967 where Lothar was a Juvenile Probation Officer, and Carole a high school English and history teacher,librarian and community college instructor. We made our first trip to Hawaii in 1975 and decided it was where we wanted our vacation home. We have 2 sons, Eric, an educator and Kris, an architect, who has given us 3 lively grandsons and a beautiful grand-daughter, ages 24 to 8. The whole family loves swimming and snorkeling, and We spent many years SCUBA diving around the world. Now that we're retired we spend most of the year in Hawaii enjoying its beauty, the beaches, the weather and the wonderful Aloha spirit of the people. We fell in love with our Kihei Alii Kai condo at first sight. Spacious rooms, a cathedral ceiling and the property amenities were many. We loved the spectacular ocean views and easy walking distance to the Kamaole Beaches - among the very best in Maui for swimming, snorkeling and boogie boarding, or just relaxing on the soft white sand with a good book. The property amenities, the ease of traveling to any point on the island and proximity to our shopping needs all made Kihei Alii Kai a perfect vacation home for us and our family. We now have a new hiking trail which begins at the Kamaole Beaches and continues all the way to Wailea. The path is easily traversed and is completely off the roadway. There are wonderful views and beach access is readily available. Restaurants dot the path in Wailea so stopping for a bite to eat or a drink is easy to do before your trip back home. Our son Eric enjoys paddling with local canoe groups and Kris has his choice of golf courses within minutes of our condo. Our grandkids race to the beach each morning and spend the day boogie boarding, swimming and playing in the surf. We also love to jump in the ocean each morning and snorkel to see the turtles and explore the reefs. Since our family uses this as our vacation home, we are very well furnished and equipped and share these amenities with our guests. We want them to have all the comforts of home, including a renovated kitchen, a 42" Smart cable TV and Wifi. We also provide beach chairs, mats and towels, beach umbrella, boogie boards, toys for the kids, and a library of good beach reads. Our covered parking, elevator and beautiful pool, jacuzzi and tennis court make this a true vacation getaway. We want this to be your home away from home too, and have made it as welcoming as we can. "Kihei no ka oi" = Kihei is the best! Short walk to Kamaole 2 beach for swimming, snorkeling, boogie board and body surfing, and just relaxing and watching the sea! 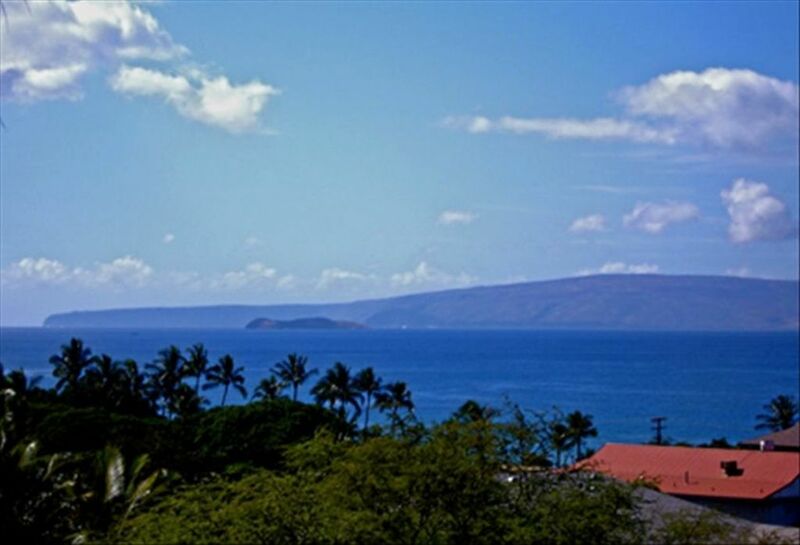 Spectacular ocean views with Molokini and Kaho'olawe Islands in distance. Condo is a 5 minute walk from Kama'ole Beach I.
Wireless phone with answering machine provided. We have both AC and ceiling fans throughout the condo for your comfort. Highspeed DSL and Wireless Internet (WiFi) connections provided at no cost to guests. Lots of spices and condiments available for guests use. All the major appliances are updated include a ceramic top stove, French door refrigerator with automatic ice maker, a full size microwave oven and a full size dishwasher. There is a DVD library of popular films for family viewing. There is a large tiled pool good for lap swimming and relaxing dips. Watch the whales from our lanai! Sunset views are spectacular as well. We also provide guests with beach chairs, beach umbrella and a cooler, as well as beach toys! *Golf at world-class courses - Wailea, Makena, Silversword, *Scuba at Marine preserves La Perouse Bay and Ahihi Kinau, Humpback Whale and Dolphin watching from December till May, *Visit the Maui Ocean Center Aquarium at Maalea Harbor,take the Sugar Cane Train,shop the galleries in Lahaina and Wailea, *Winetaste at Tedeschi Vineyards and explore Upcountry, *Go to a fitness center or spa for a massage, *Play tennis, softball, soccer,go inline skating, skateboard at Kalama Park, *Dance at Grand Wailea hotel laser disco or the many small clubs, *Hike, horseback ride or bicycle down the Haleakala volcano, or take an ATV and zipline tour, *Hike the Iao Valley, visit the Botanical Gardens and the Maui Tropical Plantation, *Enjoy Maui Community Center theater, Myth & Magic theater, and resort Luaus, *Go Fishing, and Jet Skiing, *Finally, visit lush Hana, explore lava caves and the multitude of waterfalls along the way!